Description: Three horizontal stripes, red-white-light blue. At the Congress of Vienna in 1814-1815, when the Kingdom of the Netherlands was founded, King William I (of Orange-Nassau) also received Luxembourg as a compensation for the loss of the Nassau lands in Germany. The territory was placed under the Dutch Constitution, in practice becoming the 18th province, and became also a Grand Duchy, member of the German Confederation. In 1830 Luxembourg participated in the Belgian revolt against the Dutch rule, which caused the independence of Belgium. In 1839 an agreement was reached, in which the western part of Luxembourg remained Belgian as the Province of Luxembourg. The eastern part returned to the Kingdom of the Netherlands, but the administration of the Kingdom and Grand Duchy were separated. Until 1866 the Grand Duchy was member of the German Confederation, the loss of the Walloon part being compensated for the Germans with the Dutch part of Limburg as a Duchy. King William III had no male successor in 1890. Luxembourg then became fully independent under the Nassau-Weilburg branch. According to Crampton's The World of Flags [cra90], flags in the colours of the arms (red, white and blue) were first used in 1830 during the Belgian revolt. The flag was defined as an horizontal tricolour flag on 12 June 1845. In an article published in Die Warte, a weekly cultural supplement of the daily D'Wort (aka Luxemburger Wort), Jo Kohn states that the current flag was prescribed in June 1845 in a Circular Letter by Governor Ignace de la Fontaine (at the time, the King of the Netherlands, also the Grand Duke of Luxembourg, was represented by a Governor). The Circular, addressed to District Chiefs and Mayors, informed them that the red-white-blue arrangement should, henceforth, be considered as the national flag. This followed a period of flags displaying the three colours of the arms in no fixed arrangement. The article lists, among its sources, Louis Wirion, Le drapeau luxembourgeois, in Annuaire 1950. Société héraldique luxembourgeoise, pp. 10-21. Joseph Beffort, Luxembourg. The Law prescribing the flag was adopted on 23 June 1972 and published in the Mémorial. Journal officiel du Grand-Duché de Luxembourg A-N51 on 16 August 1972. On the same date was adopted a water canal transport ensign and at the same time air ensign. The reasons why these emblems were adopted so lately are simple. Concerning the national flag there were not any laws protecting this emblem (as well as the arms of the state and of the Great Duke), which any country in the world could have adopted as its emblems (don't forget that many states became independent at that time, especially in Africa) or which could be misused by everyone. The other reason is that UNESCO wanted to have the laws and history of the Luxembourg flag at that time. Concerning the ensign, there is the same reason of emblem protection and also the fact that this ensign was unofficially already used by canal transport crafts on the Mosel to differentiate them from the Dutch crafts. The canalisation of the Mosel in the 1960-1970s which made Dutch boats capable to go to Luxembourg, with the problem of knowing who was who, urged the government to take measures. The alternative proportions of 3:5 or 1:2 were established by the amendment of 27 July 1993, as well as the colours of the flag, red Pantone 032c and blue Pantone 299c. Therefore, people or the authorities can use (and in fact use) both 3:5 and 1:2 flags, though the 3:5 model is the more common and the 1:2 seems to be rare. For Luxembourg, PMS 032 red, 299 blue (legal specifications). The vertical flag is simply the horizontal version turned 90 degrees anti-clockwise. Before 1993, the shade of the blue stripe was not defined. For example Flaggenbuch [neu92] (1941) shows a dark blue stripe, without specification of the proportions, as is to be expected. The flags of the Netherlands and of Luxembourg (as they are known internationally) are similar, but not the same, and it is just a coincidence, nothing to do with having any common origin. The colours of Luxembourg are derived from the coat of arms. The Dutch flag, which is always with 2:3 proportions. However, because the flags still look similar at a distance, Luxembourg has a distinct flag for use on civil vessels on the Rhine and elsewhere. It is a banner of the national arms. The ensign of Luxembourg, in proportions 5:7, is made of ten horizontal white and blue stripes with a red lion over all. This is a banner of the lesser national arms, nicknamed Roude Léiw (red lion). Accordingly, the illustrations of flags and coat of arms in the laws of Luxembourg do not have any official value. They are shown as examples. It is said seul le texte fait foi, meaning that you can draw whatever flag or coat of arms of Luxembourg based on the text only. No matter what the lion looks like. Album des Pavillons (2000) [pay00] shows the lion with a forked tail, the ends crossed in saltire. C. Southworth queried the design of this lion with Armand du Payrat, the editor of Album des Pavillons, a few years ago, quoting and sending him a copy of the "Law of the National Emblems" of 27 July 1993 and accompanying illustrations which apparently amended it. Armand replied that the new designs were not liked and that the older version remained in use. P. Vagnat went to Luxemburg city on request of Armand du Payrat. A main flag manufacturer there told him that the new version of the lion was not liked and the former version still in use. It could be, of course, that the artistic representation of the lion used on the official depiction of the arms differs from that used on flags, provided that both comply with the blazon (tail forked, ends crossed in saltire, crowned, etc.). There is a photo of the merchant ensign (no longer available online) which matches the Album 2000 lion, but shows the blue stripes much darker. The Grand-Ducal Regulation of 27 July 1993 which defined the colour of blue as Pantone 299c specifically included the Ensign in Article 2 (les couleurs du pavillon de la batellerie et de l'aviation sont définies de la façon suivante), so that any use of a darker blue is definitely an unofficial variant. Before 1990, the flag was the water canal transport ensign and at the same time the air ensign. Les navires immatriculés au registre sont tenus d'arborer le pavillon luxembourgeois qui comme le pavillon de la batellerie et de l'aviation défini à l'article 4 de la loi du 23 juin 1972 sur les emblèmes nationaux, se compose d'une laize de tissus aux proportions de 7 à 5 comportant un burelé d'argent et d'azur de dix pièces au lion rampant de gueules, orienté vers la hampe, couronné, armé et lampassé d'or, la queue fourchue et passée en sautoir. La description du revers correspond à celle de l'avers. Article 4 of the Law of 17 June 1994 amending the Law of 9 November 1990 (Loi du 17 juin 1994 modifiant et complétant la loi du 9 novembre 1990 ayant pour objet la création d'un registre public maritime luxembourgeois) does not mention at all le pavillon de batellerie et de l'aviation and mentions only le pavillon luxembourgeois, that is the ensign of Luxembourg. Le pavillon luxembourgeois est le pavillon tel que défini à l'article 4 de la loi modifiée du 23 juin 1972 sur les emblèmes nationaux. Il se compose d'une laize de tissus aux proportions de 7 à 5 comportant un burelé d'argent et d'azur de dix pièces au lion rampant de gueules, orienté vers la hampe, couronné, armé et lampassé d'or, la queue fourchue et passée en sautoir. La description du revers correspond à celle de l'avers. - ships registered in the inland water register, be they yachting ships or transport ships. In the latter case, the proper name of the ensign is "ensign for inland transport ships", for it was used first for these kinds of ships. According to the Law (Article 10: Effets de l'immatriculation), yachting ships (at sea or on inland rivers) shall fly the ensign of Luxembourg. The square version of the ensign is also the obverse of the Army flag and the obverse of the Gendarmerie flag. The government, as promised when the flag change was turned down (see below), proposed to grant the status of national flag to the two flags. Bill No. 6087, tabled on 23 November 2009, restricts the use of the "red lion" flag on the national territory. The bill should also give an official status to the flags of the Army and of the Police and to the Air Force marking. - Shall the Head of the State, the Chamber of Representatives, the Government and the municipalities use the two flags in the same time or in turn? - During a public event, shall one flag be hoisted on the left side of the road and theother one on the right side of he road? - Shall the two flags be used in the same number of copies to avoid vexing anyone? More seriously, the State Council expressed a main concern: "If any administration can freely decide to select a flag and exclude the other one, will the symbol of the common unity [the national flag] be brought down to the level of expression of a difference, a particularity if not a dissidence?" In practice, the two flags can be seen hoisted in several places. For instance, the Town Hall of Vianden flies the two flags, together with the flag of the European Union. The Red Lion flag is more and more seen during sports events - especially cyclist races (I guess the supporters want to be distinguished from the Dutch!). The government of Luxembourg has decided to withdraw the bill to change the flag of the country. Grand Duke Henri gave his permission by Decree on 14 March 2017. The then Prime Minister of Luxembourg, Jean-Claude Juncker, tabled November 13, 2009, Bill No. 6087, to alter the flag of the country. Instead of a flag which is very similar to that of the Netherlands, he proposed to make the civil ensign, which was introduced in 1972, the national flag. This is the one with alternate blue and white horizontal stripes and a red lion on top of them. The initiative to change the flag by law came after in 2006 member of Parliament Michel Wolter tabled a Bill (No 5717) in that same respect. A reason for the recent withdrawal of the 2009 Project to change the flag is not given. The government of Luxembourg decided on 6 July 2007 that the national flag will not be changed. The "red lion" on blue and white stripes may, however, be granted in the future a legal status for use on land during patriotic, sports or cultural events. The Council of the Government today officially took the position on the topic of the proposition of deputy Michel Wolter (CSV) aiming at replacing the national flag. The Council opted to have the flag of the Grand-Duchy remain the tricolor red-white-blue banner. [...] Michel Wolter tabled his law proposal to change the tricolor flag for a national emblem with a very strong symbolic value, dating back to the Middle Ages. 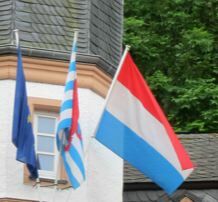 His move intended to better personalize the Luxembourg flag, which can be mistaken for the Netherlands flag. The issue has been a matter of polemic, revealing a country profoundly divided on this question: the old-timers seem to prefer the Roude Léiw (the Red Lion) because it is the emblem of the liberation of 1945, while others see in the red lion a sign of a nationalistic withdrawal. As reported in the newspaper d'Wort, 5 October 2006, the proposal to change the Luxembourg flag (Initiativ Roude Léiw website) will be submitted by none less than the leader of the parliamentary party CSV, Michel Wolter. Note he is not the leader of the party nor even the country's Prime Minister but rather the leader of the party's MPs. Apparently, he will be proposing that Luxembourg drop its tricolour and adopt, instead, the banner of the arms, which currently serves as civil ensign. The reason he gives is that this flag is more distinctive and incorporates the Roude Léiw the Red Lion, which Luxembourgers are very fond of as symbol of their tiny country. He told d'Wort, Luxembourg's biggest daily and a staunch supporter of CSV, that he has got the agreement of the other MPs of his party for putting forward this proposal, but has no idea what the other parties think. He says if they don't agree and the proposal fails, "that's still alright". Significantly, d'Wort (the paper version), also prints a scathing commentary which states that Luxembourgers have far more serious problems than a possible change of their national flag and makes it sound that the whole idea is a an example of Wolter's apparently well-known pigheadedness! Wolter himself says that he discussed the matter with around 300 persons who all voiced support for the idea. CSV (centre-right) is the country's largest party but does not have an absolute majority in Parliament, although the country's PM, J.C. Junker, is a CSV member as have been all Luxembourg's PMs from 1926 to the present day, the exception being the 1974-1979 government of G. Thorn.